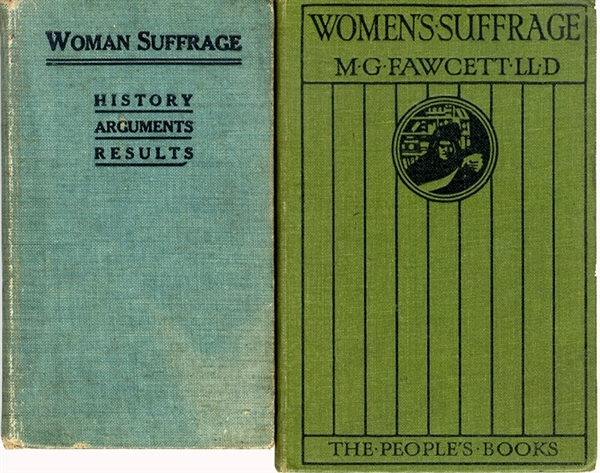 Pair of suffrage books, includes: “WOMAN SUFFRAGE HISTORY ARGUMENTS AND RESULTS” 1913 238pp. 12mo, printed by the National American Woman Suffrage Association, New York. Very good condition...plus; “WOMEN’S SUFFRAGE A SHORT HISTORY OF GREAT MOVEMENT” By Millicent Garrett Fawcett, London, 1912, 94pp. Very good condition. Before the ratification of the Nineteenth Amendment in 1920, individual states had passed legislation that allowed women to vote in different types of elections; some only allowed women to vote in school or municipal elections, some required that women owned property if they wanted to vote, and some territories extended full suffrage to women, only to take it away once they became states. Although legally entitled to vote, black women were effectively denied voting rights in numerous Southern states until 1965.